The Christian church (small “c” intended) is dying, at least in the western parts of the world. It is inevitable. When I say this, it pisses off all my Christian friends. This whole idea came home to me once again recently, when I expressed this concern within the walls of a church. The response was denial and . . . well not quite hostility . . . but, an unease toward my comments. It wasn’t just seeing me as the bearer of bad news, but a bad guy, who was trying to stir up trouble with cynical news. This is the attitude I have always faced when I have attempted to have this discussion from within the church. That’s why I have given up. It left within me this haunting feeling that the church cannot be saved. It is as if you could go back in a time machine and board the Titanic. As soon as she struck the iceberg you would be screaming for people to board the lifeboats, but they in turn, lift their champagne glasses into the air and dismiss you as a negative person who was unlearned in the fine arts of nautical engineering. For truly the Titanic was indestructible . . . or was it? I have said before that the church, which I presently attend, is one of the healthiest I have ever been associated with. I am not a big fan of the American Sunday morning church service tradition, but I enjoy this church’s Sunday morning service more than any before. I think this church has the most dynamic youth program than I have seen in a long time. The youth leaders and pastors work hard. Yet, like all other churches, this church has a big hole in the 20 to 39-year-old group. Sometimes, like at holidays, some of the twenty-something children come home and attend, but they do not associate with any church the rest of the year. So, this means this church will not be viable in 20-30 years, when us old farts are all gone. When I have been able to get past the first couple of sentences about this problem, (at the last 4-5 churches I have attended), the verbiage that I hear in return is always the same. First, there is a defensive statement how that particular church has a fantastic youth program. Then, there are comments of how bad the youth are, in general, today. Next, they quickly attempt to put the blame on anyone, but ourselves. It’s the media they are exposed to. It is the non-Christian colleges they attend. It is the temptations that youth face now. It might be cell phones or Face Book (I think the Millennials have moved beyond FB by now). I grow distance, as the chatter continues, knowing that I am not making sense to them. Then, the conversation always ends with them telling me that when a child is raised in a good Christian home, he or she never leaves the faith. This is wishful thinking and simply not true. Being unsinkable was the wish of the Titanic passengers too. The same rate (>80%) of leaving applies to the kids from the best Christian families, hauled week after week, to the best youth groups. I see this both in the studies and in personal experience. I had this same conversation recently with a good friend, who is an elder in a PCA (Presbyterian Church in America) church. He pointed out that this was not true in his church, where they have a very dynamic and growing 20-30 year-old group. He implied, or I wrongly thought he was implying, that it was because of being a good denomination. However, I think the reason his church is doing so well, (and I’m glad they are), is that they just sit off campus of a major university where 18,000 on-campus students reside. This is also in the Bible-belt, where church attendance is the highest in general. But the vast majority of the 18,000, maybe 17,000 +, don’t go to any church. I will also give him credit that his denomination is one of the few growing churches in America, at least for the past 4 years (previous it, too was in decline). 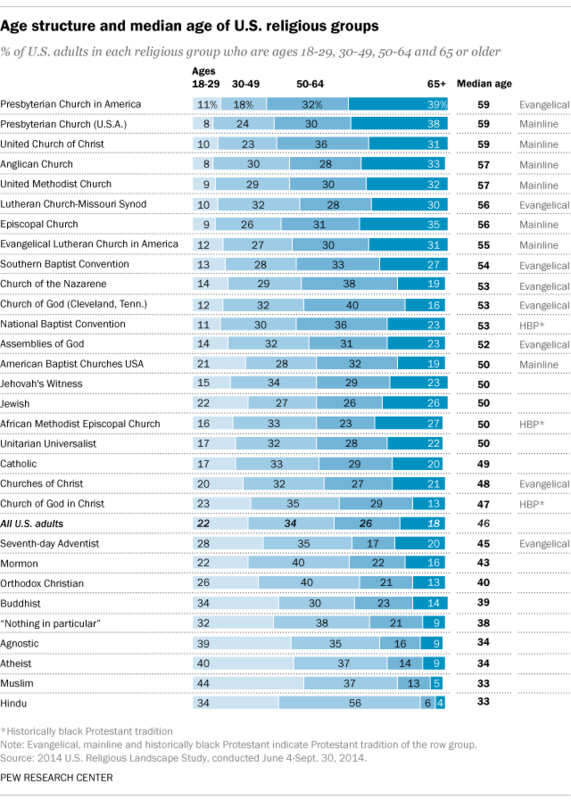 However, to be fair, his denomination as a whole is also the oldest one in America (average age 59) with the least number of members in the 20-30 age group, (see figure 1). While his church is oldest, they barely beat out my own denomination, which is the second oldest. In Part II I will start to look into the future of what the church of 2050 will have to look like, in order to survive. At the same time, 80% of white evangelicals voted for Trump. And a good chunk of those still literally worship Him like those who Took the Mark in a bad Christian Apocalyptic novel. — ChapmanEd, commenter over at Wondering Eagle who is always first with the Bible bullets when the Trump is blasphemed in any way. I read somewhere that 80% is the threshold where Groupthink locks in, the 80% becomes The One True Way, and all Dissidents and Heretics are Purged.